It is with deep sadness we note the passing of Jim Putt our former treasurer on Sunday, 16 September, 2018 in Perth, Western Australia. 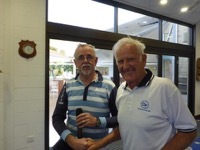 As many of us in Western Australia know, Jim was a fantastic sailor, a keen supporter of Fremantle Sailing Club, and of course the owner of Morning Tide an S&S 34 Mark 1 which he fitted out himself from new. 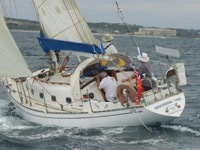 He and his lovely wife Margaret sailed together in a circumnavigation between 1991 and 1997 in Morning Tide. The record of this journey was captured by Margaret and can be found on our website. Jim was also a key contributor of the Western Australian Cruising Guide which is indispensable to anyone wishing to sail the Western Australian coast. Jim’s contribution to the S&S34 Association cannot be overstated. He was a great influence in the way the association has developed over the years. Jim will be sorely missed by us all. Our thoughts and prayers go out to his family at this time. Funeral service is to be held at Friday 21 September at 10:00AM at St Edmund’s Anglican Church, 54 Pangbourne Street, Wembley , Western Australia. This entry was posted in News and tagged Jim Putt, Morning Tide by Ron Kooy. Bookmark the permalink.